I grew up playing soccer all my life. At around 8 years old, I started playing for my local league and soon began playing for county and state select teams all the way up into college. Having experienced the need for teamwork, communication and the right coaching, there’s no doubt that now, so many years later, I can make a clear connection between sports and business. Although each team may have their star player, a good coach will tell you that you can’t win games without the involvement of the entire team. It’s the same with business. While we search for new, aspiring talent, it’s the work behind the scenes that ultimately determines a team’s success. So, what exactly makes a team successful? Communication. Every successful team needs an open line of communication. One of my favorite coaches used to have us play scrimmages in silence all the time; we’d wave our arms frantically at each other and get frustrated when our teammates couldn’t see us. The activity proved that communication was necessary for a team to be successful. Get in touch with your team. Hold meetings with your team on a weekly or monthly basis to learn more about their workload. Schedule planning meetings with employees to gather feedback before beginning a new project or making team decisions. Communication will only help your team stay connected to each other and to you. Teamwork. Every coach knows that a team is made up of different players: the goal scorer, the playmaker, the future coach. Managing a team can be difficult with so many different personalities and priorities. It can become especially difficult to keep everyone calm and productive during stressful situations. Whether you’re coming up on an important deadline or preparing for a company-wide change, stressful situations will happen, and conflict may occur. Learn more about resolving conflicts by taking online courses or behavioral assessments for your entire team. Your team needs to work effectively together to maintain (or increase!) productivity levels. Evaluation. Every manager should take time out to evaluate each of their employees. Whether this is done on a monthly, quarterly or yearly basis is up to you. But make sure you take time out to meet with your players to discuss how they think they and the team are doing. Yearly performance reviews are a great place to start. You’ll spend one-on-one time with each of your players to learn more about them, their opinions, their workload and you’ll get a much better grasp on what you could be doing to coach each of your players more effectively. Training. Just as important as employee evaluation is the need for training. Just as sports teams need conditioning, your employees need continuous training and development opportunities. Not only will they develop their skills, but providing development opportunities helps to improve company culture and increase employee retention. Coaching. And last, but certainly not least, is leadership. 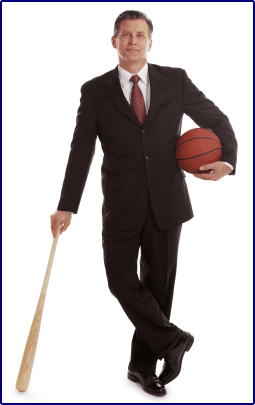 Every winning team has an organized, knowledgeable coach pushing the staff to be successful. All of the above steps cannot be completed without you, the manager. If you’re worried about your team’s success, evaluate your leadership strategies. Every team member is different, and an effective leader knows how to adjust their managerial style to each of their staff members. It’s important to know what motivates and demotivates and, even more importantly, to lead appropriately after knowing this information. Take this time to evaluate your team. How do you measure up? Are you worthy of March Madness selection? Do you think you could make it to the Sweet 16, Elite 8 or even the Final Four? What makes your team special, and what does your team need to work on? Answering these questions and putting the above suggestions in place will put you closer to winning a championship. Online Management Courses – Accredited, self-paced courses. New courses available specifically for new managers! Online Leadership Courses – Accredited, self-paced courses designed to help leaders of all experience levels lead effectively. Everything DiSC® for Workplace – DiSC assessment ideal for any member of a team – focuses on effective communication. Everything DiSC® for Management – Compatible with Workplace, DiSC for Managers will give you great insight on managing employees of all behavioral styles. Team Dimensions – Online or Paper Assessments that will help you determine how your team members influence each other.